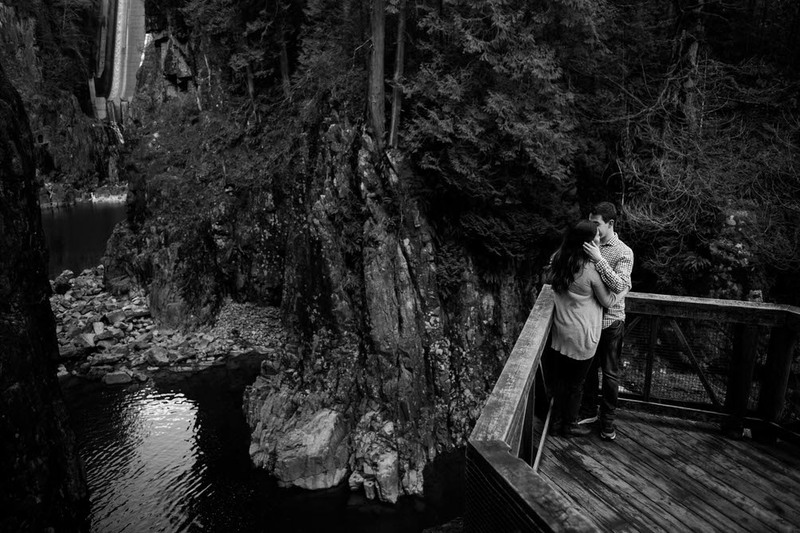 Simply stunning sums up Cleveland Dam as an engagement shoot spot pretty nicely. The Dam itself sits inside Capilano River Regional Park, spilling an impressive 300 feet down to Capilano Lake, which means plenty of protected natural landscapes available to lend your photos a down-to-earth feel. This is especially true if you decide to wander a little from the dam and lake down below into some of the surrounding trees. The real beauty of this spot, however, is the fact that marvelous feats of human engineering and the untouched natural beauty of Mother Nature coexist side-by-side, so you get to incorporate the best of both worlds into your shoot. For more information visit the Cleveland Dam website. 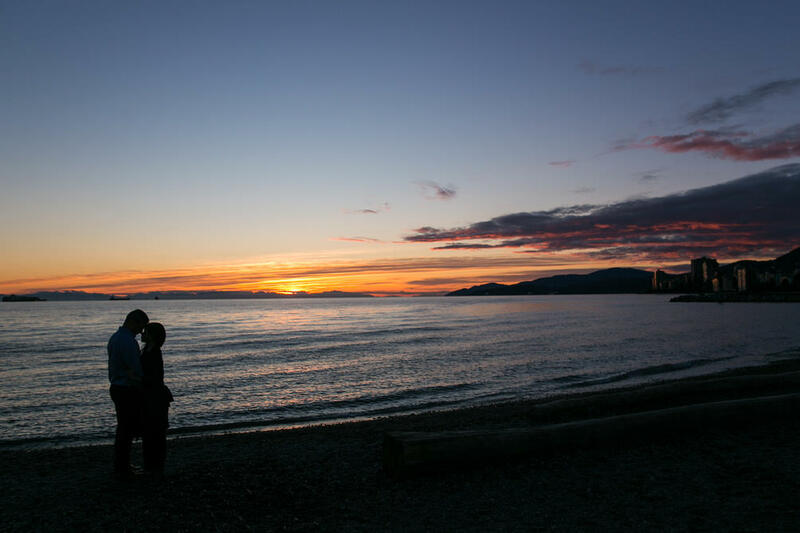 Over in West Vancouver, nestled into a cozy cove not far from Horseshoe Bay is Whytecliff Park; an intimate seaside location for couples with a penchant for finding themselves a little off the beaten track. Though a bit of extra legwork (literally) is required for this one, the rewards include a sublime seascape complete with the exquisite texture of a pebbled beach and the idiosyncratic vegetation thriving on a charming mass of rock just off the shore, to add some visual interest. Plus, there is the distinct possibility of a seal or two making guest appearances in a few shots, which is pretty cool if you’re into that kind of thing. For more information visit the Whytecliff Park website. 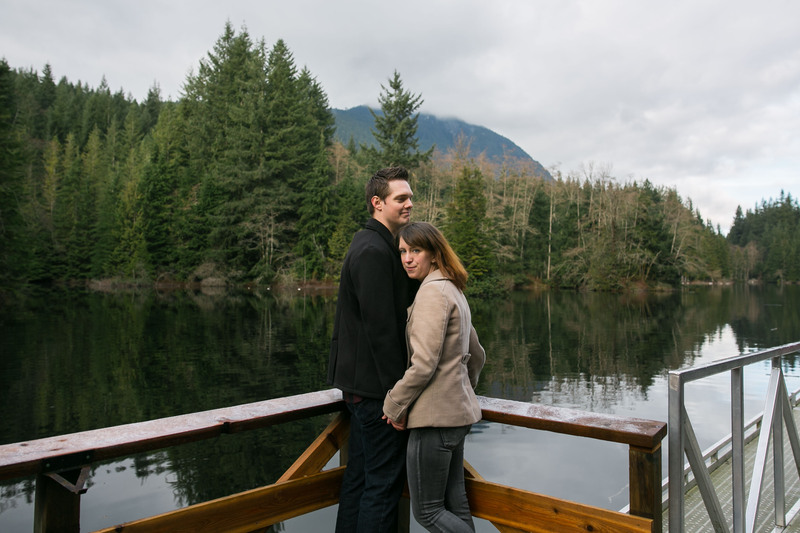 “Spawning Season” may not be the most romantic phrase ever uttered, but when you find yourself at Capilano Salmon Hatchery with your fiance by your side and a professional photographer tagging along, it is the one thing to take the whole scene to next level dreamy. The Capilano River gushes through alluring natural landscapes protected by the warm embrace of Capilano River Regional Park (yes, the same lovely park that houses Cleveland Dam), and is known for the abundance of ruby red salmon who heroically fight upstream, continuously jumping out of the water to do so. Of course, this isn’t a year-round occurrence but happens only during one special time of year; spawning season. So, if you’re looking for a classic mountain river scene with a little extra pizazz, look no farther. For more information visit the Capilano Salmon Hatchery website. 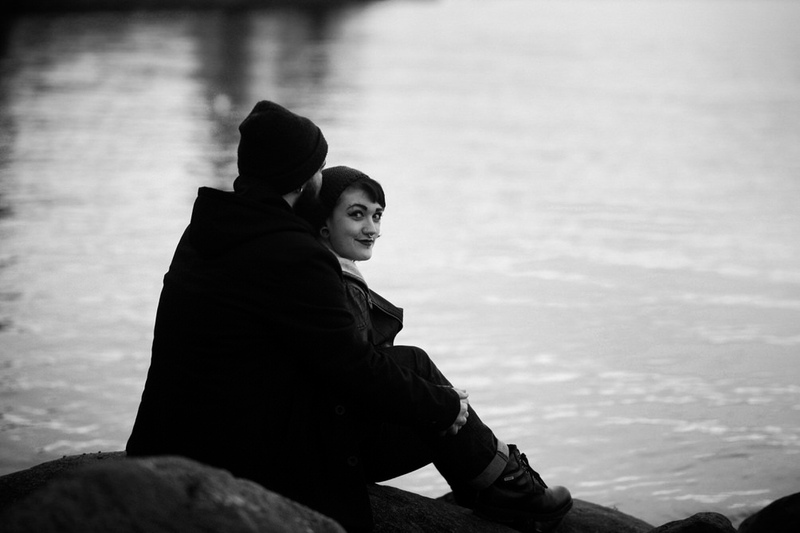 Vancouver is known for its bounty of breathtaking wild playgrounds and adventurous spirit, but it also is a lively city with plenty of civilized entertainment for a young couple. Which is why Ambleside Park makes such a desirable shoot location. Not only does the park put you right on the shore, but the city also stands tall in the not-too-far distance, giving you the chance to incorporate both the beloved natural side and the dynamic urban side of Vancouver into your treasured photos. And, to top it all off, the park is very dog-friendly. Which means no one has to be left out. For more information visit the Ambleside Park website. If the mountains speak to you, but you aren’t sure you want to let go of the stunning serenity great bodies of water lend to an image, Rice Lake has you covered. A loop around the lake is about 3 km long, so, as far as bodies of water go, it’s not the greatest in size. However, it is plenty big when it comes to adding that extra little sparkle, plus it puts you right into the majesty of North Vancouver mountains and surrounds you with untamed pines. You might even have the good fortune of catching a couple rainbow trout while you’re up there if you find yourself with a few extra minutes. For more information visit this Vancouver outdoor guide, if that doesn’t answer your questions, give this one a shot. 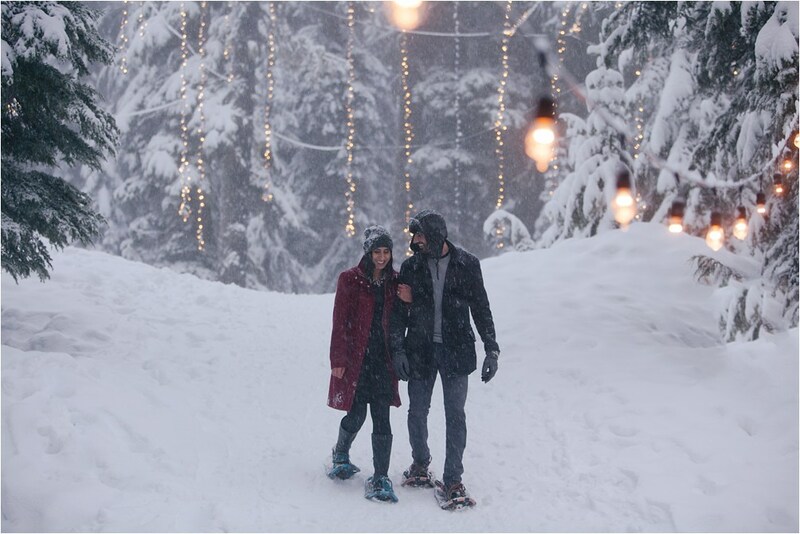 Another spectacular option for incorporating a love of the mountains into the shoot that will capture your love for one another is Grouse Mountain. The resort offers a whole range of classic mountain scenes from woodsy lodges, to sweeping overlooks, to thriving wildflower gardens in the Summer, and an abundance of sparkling snowy branches in the Winter. As a top-notch resort, Grouse Mountain not only offers a little variety but is also fairly easily accessible. In other words, it is a dream come true for anyone who treasures all the breathtaking scenery a little elevation has to offer but isn’t super interested in trying to look photoshoot ready directly after a grueling hike. For more information visit the Grouse Mountain website. So far, we’ve covered great options for getting a little piece of ocean, river, and lake into your photos, but what about the most dramatic water feature of them all; waterfalls? Well, my friends, that is where Cypress Falls Park comes in. A short walk will bring you to the first thundering set of falls, where the water, the movement, the trees that have acted as sentinels of the falls for centuries, all come together to create a magical scene. 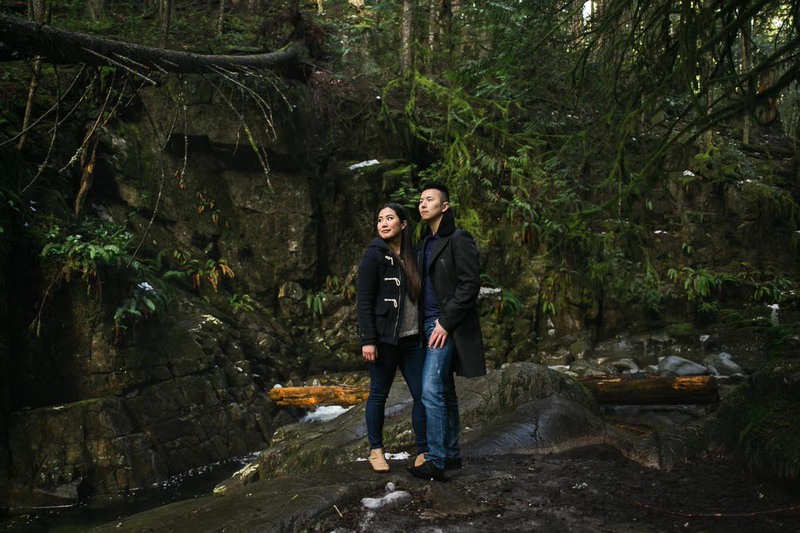 And the more ambitious couple can venture even further into this enchanting set to the upper falls, where the shoot will take on an added layer of isolation and mystique. For more information visit the Cypress Falls Park website. 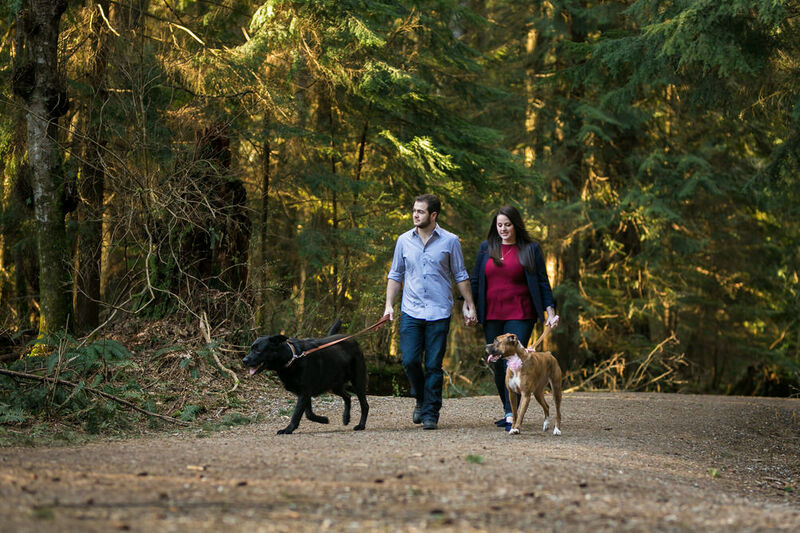 Sprawling over an impressive 435 acres, Mundy Park provides plenty of space to play with your shoot. The shady trails connect you to not one, but two lakes; Mundy and Lost Lake. If an inviting little bench of the shore of Lost Lake doesn’t sound downright idyllic, I don’t know what does. And, as if that wasn’t enough, the trail system also meanders through wide open green spaces and over charming bridges tucked away amongst the trees. Plus, any Supernatural fans out there will probably recognize the park as a commonly used set location, which puts you in a pretty good company when choosing Mundy as an engagement shoot spot. For more information visit the Mundy Park website. 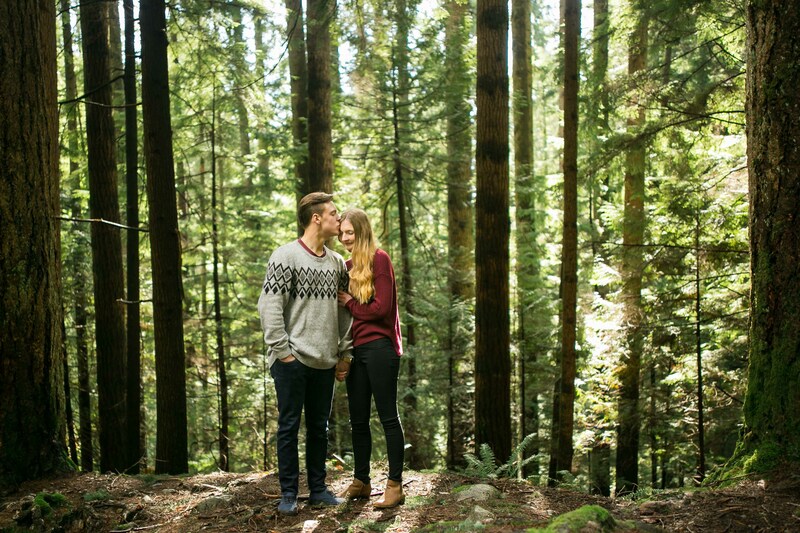 Packed with iconic sights and famous cultural landmarks, Vancouver’s very first park is also one of its very best locations for an engagement shoot. The park I’m referring to is, of course, Stanley Park, with its signature Seawall views, sunny beaches, and flourishing gardens. In fact, there are three unique gardens to choose from, including one dedicated exclusively to the trees of Shakespeare. The much-loved totem poles of Brockton Point also reside inside the park along with a range of other sculptures, memorials, and monuments. Stanley manages to offer delightful variety without straying from a unique vibe that is unmistakably Vancouver to its core. For more information visit the Stanley Park website. Sunny, sandy, salty; the three S’s essential to any perfect beach destination, and you better bet Crescent Beach has ‘em all. 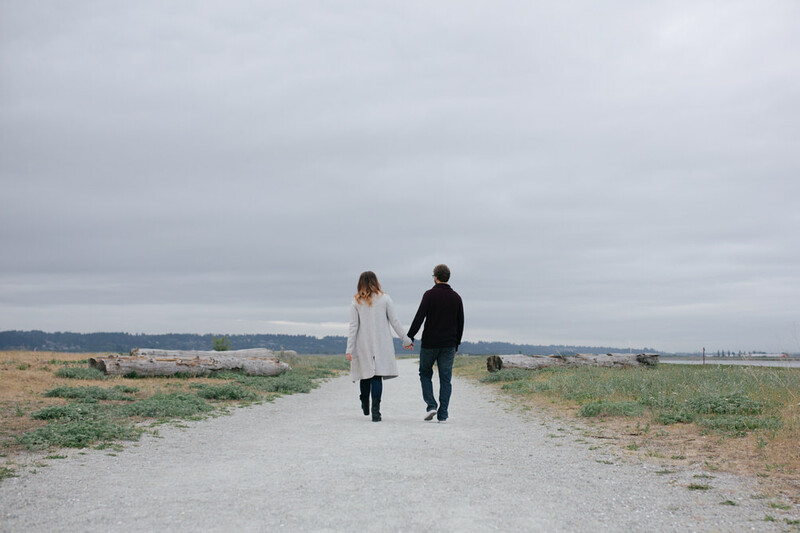 For this exact reason, Crescent Beach is the place to be if you’re looking for that light, bright, breezy, beautiful beach photoshoot. Create timeless images capturing the treasured bond between you and your betrothed all the while enjoying a gentle wind in your hair and sand between your toes. If you play your cards right, you can even score one of those highly coveted, wholly authentic glowing-beach-sunset-backdrops for your photos. Just keep in mind that the best time to go will be during low tide, so you’ll have to plan your shoot accordingly. For more information visit this Vancouver outdoor guide, if you still have questions, try this one.